Your Dreams Coming True In The Kitchen: Grilled Boneless Breast Of Chicken Skewers Tandoori Style. Grilled Boneless Breast Of Chicken Skewers Tandoori Style. The marinade is made up of yogurt, oil, vinegar, and a very find mixture of Indian herbs and spices to form the reddish color tandoori mixture. Yogurt is a very important ingredient in Indian food . I call it the "fire extinguisher" and catalyst for digestion!! I have presented many recipes using this tandoori mix but it can be presented in a different manner every time, giving you ideas how to serve it. This time I have cut the boneless chicken breast into cubes and threaded through little skewers enough to feed 4 persons 2 skewers per person. 600 gr of boned chicken breast with no skin., cut in cubes. ½ bunch fresh coriander (cilantro) finely chopped. 4 small round pita breads. 1 small onion sliced in rings. 4 Tbsp yogurt (even Greek thick yogurt will do). 2 heap full tsp Tandoori Mix. Mix well the above ingredients for the marinade. Coat chicken cubes well with the marinade. Cover with cling film and refrigerate for at least 2 hours or overnight. Before grilling, divide the chicken equally to make 8 skewers. Brush with some oil to prevent from sticking to the grill. Grill turning occasionally until done to your liking. But remember chicken is never eaten rare. Chicken must be well cooked. 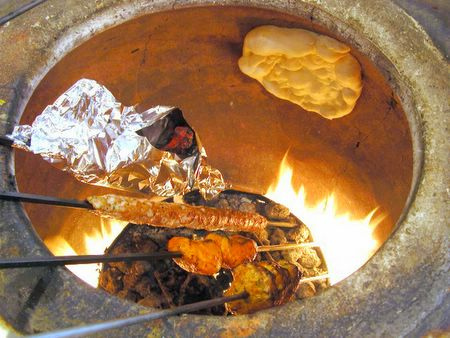 While grilling place the pita bread on top of the skewers to heat as the chicken cooks. Serve two skewers on each pita bread, sprinkle cilantro, sliced onions, and a dollop of yogurt.